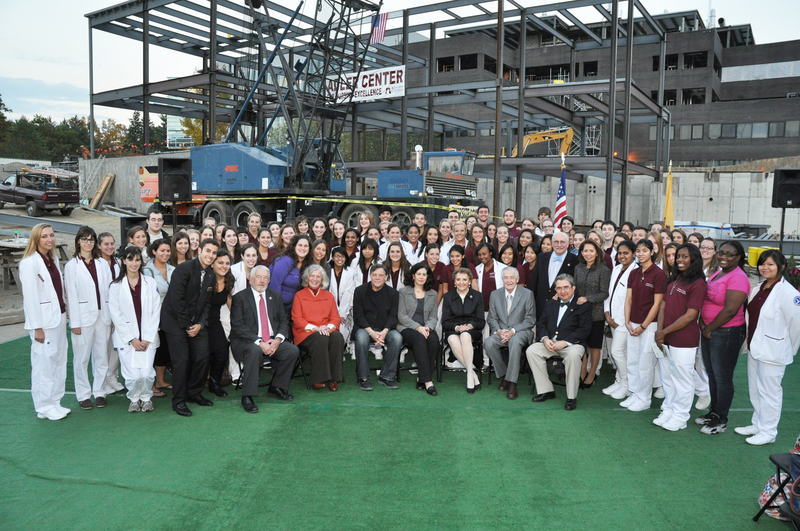 (MAHWAH, NJ) – Ramapo College’s new Adler Center for Nursing Excellence moved a step closer to completion recently, as donors Myron and Elaine Adler and College officials signed the last beam to “top off” the two- and one-half story structure on the College campus. 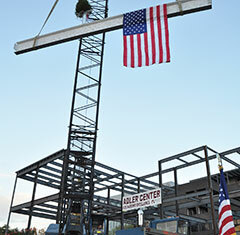 The Topping Off ceremony is a centuries-old milestone celebrated during construction projects. 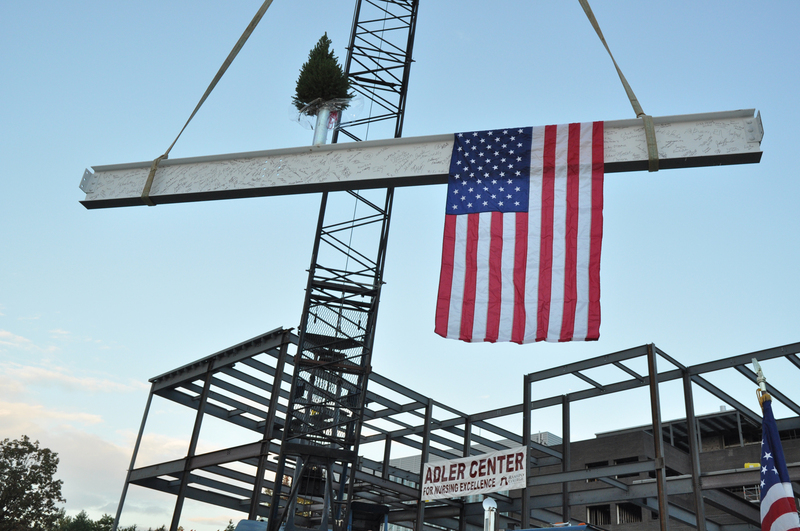 The beam was signed by the Adlers, President Peter P. Mercer, members of the Ramapo College Board of the Trustees and Board of Governors, and nursing students, and then raised by a crane atop the structure. In November 2010, the Adlers made a $2 million gift to name the Adler Center for Nursing Excellence. The Adler Center will be the new home of Ramapo College’s highly-acclaimed and expanding Nursing programs, as well as state-of-the-art labs to enhance the education of Ramapo College students in the sciences. Ramapo’s undergraduate Nursing program has had significant increases in enrollment since its inception in 1993, and a Master of Science in Nursing Education was added in 2002. More than 460 students are enrolled in both Nursing programs and will use the facilities of the Adler Center for Nursing Excellence. The new Adler Center for Nursing Excellence features three simulation rooms where students will learn to address emergencies involving their computer-simulated patients. Nursing faculty located in a control room recreate medical scenarios that play out each day in hospitals, making each patient encounter unique. Students are videotaped and, in a debriefing room, they receive invaluable feedback from their instructors on how to improve their skills and reaction times. A Nursing Skills Lab will teach students the necessary basics of nursing, including physical assessment of a patient and the many procedures that make up skilled nursing. The Adler Center also features an Anatomy and Physiology Lab, computer labs, as well as general purpose classrooms. A conference room, a café with gallery space and an assistant dean’s suite are incorporated into the plans. The 36,000 square foot Adler Center will be connected by an overhead walkway to the science building that is currently undergoing a complete renovation. The Adlers have been consistent supporters of Ramapo College for more than 25 years. Mrs. Adler is a member of the Ramapo College Board of Governors and the couple has provided numerous gifts to support the College’s Annual Fund, student scholarships, the Gross Center for Holocaust and Genocide Studies, the Distinguished Citizens Dinner, the Golf Outing. They have also provided a capital gift for the Adler Theatre in the Berrie Center for the Performing and Visual Arts. The Adlers founded The Adler Aphasia Center in Maywood, NJ in 2003 and have been honored nationally for their work in helping individuals with the disorder redevelop their communication skills. Mr. Adler is a member of the board of the National Aphasia Association and has served on the board of Hackensack University Medical Center and the United Jewish Community of Bergen County. Mrs. Adler is a trustee of the Arnold P. Gold Foundation for Humanism in Medicine, the Center for Interreligious Understanding and a founding board member of Gilda’s Club of Northern New Jersey. She also serves on the board of the Community Resource Council and the USA Toy Library Association and is vice president of the Jewish Home and Rehabilitation Center in Rockleigh, NJ.